Rev. Fr. Prof. Emmanuel M.P. Edeh is catholic priest of the Holy Ghost congregation, a man who does not count the cost in giving in as much as the beneficiary is revived. Here is a man who has empowered so many people in diverse ways: physically, socially, mentally, spiritually, and educationally. He is a "Millennium Gift" to Mankind. A man who has through his life and works touched the lives of millions of people and has been described as a "Giant of Peace" by many people. As a Priest, he is gifted with "Effective Intercession" in prayer. No wonder so many people are seen gathering around him and he does for them that which he knows how best to do; that is, giving peace and consolation to the troubled minds; peace to broken homes, peace to families, peace to towns and villages, peace to the society, and indeed peace to the Modern World. Fr. Edeh is really determined to transform the modern society through peace, youth empowerment, practical and effective charity. Madonna University Nigeria ~ Founded on 10 May 1999 in Okija, Anambra State, it was established by E.M.P. Edeh (Very Rev. Fr. 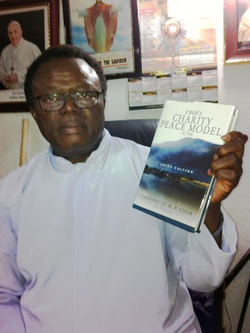 Prof. E. M. P. Edeh (CSSP) (OFR). Edeh had founded Our Saviour Institute of Science and Technology in Enugu the previous year. The university offers various courses including Law, Management, Natural Sciences, Social Sciences, Medicine, Pharmacy and Engineering. and the admission requirements are a minimum of 5 credits at no more than two sittings of the O-level schools Certificate Examination.